The thyroid gland is a butterfly shaped structure that lies on the windpipe below the Adam's Apple.The thyroid can be likened to a butterfly. The thyroid lobes can be imagined as wings that wrap themselves around the windpipe while the body lies in front of the windpipe and is called the thyroid isthmus. The isthmus usually lies over the second and third tracheal rings opposite the fifth, sixth and seventh cervical vertebrae. The lobes of the thyroid are almost always asymmetrical with the right lobe larger than the left. The thyroid is usually larger in women than men. The total weight of the thyroid is approximately 20-25 grams but is smaller in parts of the world where supplies of iodine are abundant. The thyroid is a very vascular organ and is surrounded by a sheath. This sheath attaches the thyroid to the larynx and the trachea. Anteriorly, the sternohyoid and sternothyroid muscles overlie each of the lobes. A pyramidal lobe is also often present and it projects upwards from the isthmus as seen in the diagram. A fibrous or muscular band frequently connects the pyramidal lobe to the hyoid bone. The major blood supply to the thyroid is from the paired superior and inferior thyroid arteries. 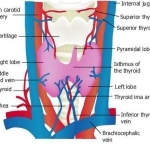 The superior thyroid is a branch of the external carotid artery and enters the thyroid at the upper poles of each lobe. The artery is a accompanied by the external branch of the superior laryngeal nerve. The inferior thyroid artery is a branch of the thyrocervical trunk and it runs behind the gland to the level of the cricoid cartilage. It then turns medially and downwards to supply the posterior of the gland. The Thyroidea Ima Artery of Neubauer (first described by Nicolai in 1725 - quoted by Neubauer,Op Anatom.collecta 1786)) is a lower thyroid artery (the thyroid ima) that may may arise from the brachiocephalic artery ,the arch of the aorta, or internal mammary arteries. It climbs up to the thyroid in front of the trachea and runs over the thyroid isthmus. Its liable to be cut when performing a tracheostomy. . The vessel is usually single but can be a paired structure, it is said to be more common on the right and if very large is may be associated with absent inferior thyroid arteries. It ia said to occur in 10% of patients but i regard this as an exaggeration. It can supply the parathyroids and division can cause hypoparathyroidism. All the arteries anastomose with each other over the surface of the gland. The superior and middle thyroid veins drain into the internal jugular vein. The inferior thyroid veins anastomose with each other and drain into the left brachiocephalic vein in the thorax. The parathyroid glands are usually found at the posterolateral borders of the thyroid lobes and in 80% of cases, their blood supply is via the inferior thyroid artery. The position and number of parathyroid glands is variable, although four is the most common. 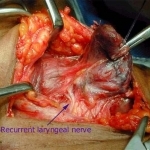 The recurrent laryngeal nerve runs either in front of or behind the inferior thyroid artery and it is essential to locate this nerve during a thyroidectomy. The nerve is paired and arises from the vagus. It supplies all the muscles of the larynx (except the cricothyroid). On the right hand side, the nerve passes behind the vagus and loops around the subclavian artery. On the left, the nerve passes around the arch of the aorta. The nerves pass beneath Berry's ligament (a thickened area of fascia next to the trachea) and enter the larynx. The recurrent laryngeal nerve can be 'non-recurrent' on the right in 1% of cases. A left non-recurrent laryngeal nerve is only possible with a right-sided aorta. The embryology of the thyroid is complex.The thyroid is the first endocrine gland to develop (forming as early as 3-4 weeks). It is derived by the fusion of median and lateral components.The lateral components also known as the ultimobranchial body fuses with a median component from an epithelial proliferation of the floor of the pharynx.Thismedial component migrates downwards from the floor of the pharynx along a tract, known as the thyroglossal tract. In the seventh week of development it reaches its final position in front of the trachea. During the migration the thyroid remains connected to the floor of the pharynx by the thyroglossal duct. After migration the duct disappears, but ectopic thyroid tissue may be found anywhere along the tract. 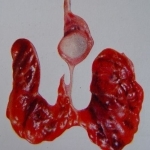 Remnants of the duct may remain as functioning thyroid units at three different levels. These levels are either at a lingual site (at the back of the tongue), a pyramidal lobe (next to the thyroid) or as non-functioning cysts anywhere along the tract. The lateral and median components fuse when the embryo is 13 mm long. In the adult the lateral component may be enlarged and is known as the tubercle of Zuckerkandl.